Conclusion: Pathology of the lung nodule revealed abundant malignant cells with morphology consistent with adenocarcinoma. An immunohistochemical profile confirmed prostatic origin. The patient proceeded with advanced line systemic therapy. This 54 year-old male with a history of tobacco smoking and surgically treated prostate cancer presented for evaluation of a new middle lobe lung nodule. Using the SPiN Planning™ software, Dr. Chrissian targeted a RML lesion measuring 27mm in maximum diameter. It appeared to be eccentrically located around two first generation, sub segmental, middle lobe bronchi without endoluminal intrusion. 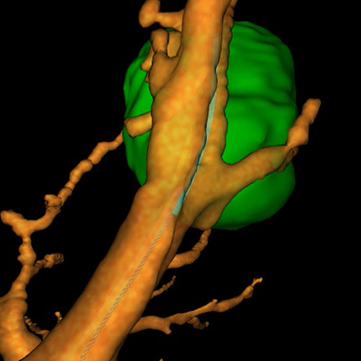 It was deemed to be too peripheral to be reached by linear EBUS, therefore a plan was created with the intention of using the SPiN Xtend™ 21ga transbronchial needle to access the lesion. 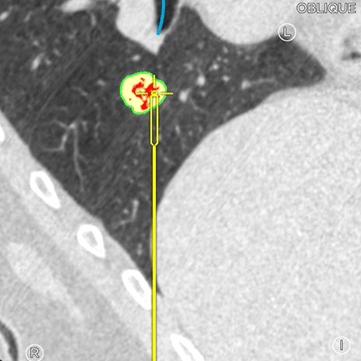 The plan set an exit point from the nearest airway that was 3cm from the targeted nodule. Using a bronchoscope, an inspection of the tracheobronchial mucosa to the sub-segmental level was performed. It was normal except for some mild edema and narrowing of one of the posterolateral branches of the RB4a bronchus. No endoluminal lesion was identified. 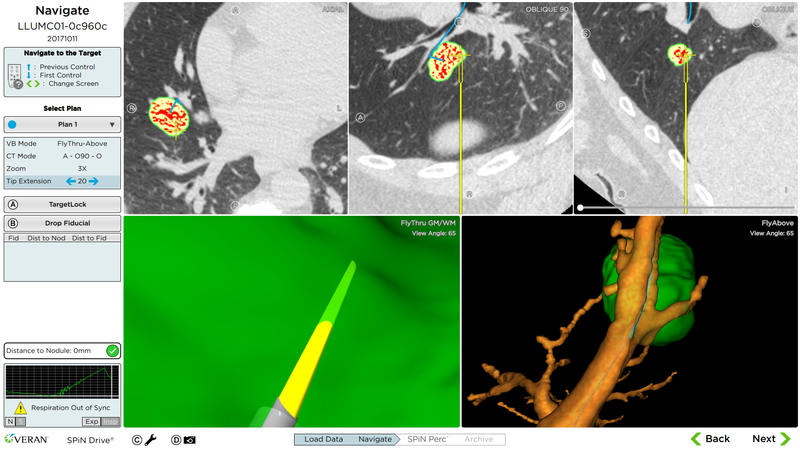 An Always-On Tip Tracked® SPiN Xtend™ 21ga transbronchial needle was inserted into the bronchoscope. With the tip extended just out of the working channel, navigational accuracy was verified per protocol. The bronchoscope was then directed toward the RB4a bronchus and to the lesion using navigational guidance. 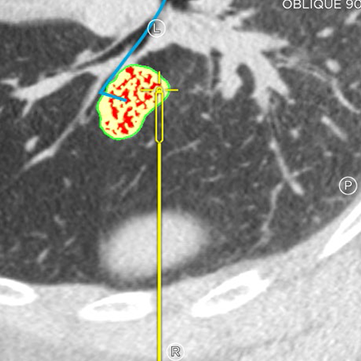 The site of the target mucosal entry point was visually marked. The needle was then set to 3cm and advanced into the lesion under navigational guidance. Aspirates were taken and sent for cytologic and histologic analysis. A total of three robust samples were obtained. A routine mediastinal evaluation utilizing linear EBUS was then performed to complete the procedure.